Spring is here, winter seems to finally be behind us and slowly the days seem to be getting warmer. I’ve begun packing away all the winter coats, boots, gloves and scarves and have started pulling out my spring and summer wardrobe. My Stitch Fix for March also screamed spring and today I’m sharing with you what was in my Fix. Before I get into my March Stitch Fix Review, I wanted to give you a little background just in case you are new to the styling service. Stitch Fix is a monthly styling service where you provide information in a profile about your age, size, lifestyle, budget and style preferences and then you are assigned a stylist that will personally put together a “Fix” which includes 5 items. Your stylist will send it to you along with pricing, a note and style cards to help you find ways to wear the item. You try everything on at home, keep what you love and return the rest. Your only task is to provide feedback on each item whether you are keeping it or returning it and through this information that you provide, your stylist is able to send you better and better fixes each and every time. You can see past fixes and find out more about Stitch Fix Here and Here. If you’ve been following my fixes for any length of time, you may notice this one looks a little different than in the past. This is because I specifically asked for more business appropriate options. I few recent events made me realize that my closet is completely casual these days and I don’t have anything appropriate for any kind of business event. 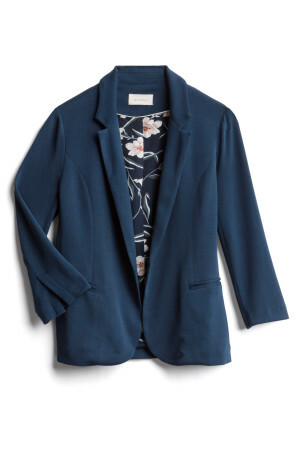 This knit blazer is beautiful down to the floral print liner inside! This kind of a deep navy blue / teal color that is lovely and unique. The fabric is knit but it’s has a slight sheen to it that makes it look a bit more upscale. IT’s also extremely comfortable which is always a bonus in my book. This was maybe my least favorite item in the fix but that implies that it’s not great. This top is great. 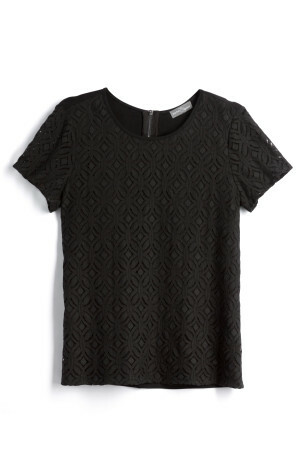 It’s black which doesn’t necessarily scream spring but it’s really cute. The lace detail covers the front of the top and there is an exposed zipper at the top in the back which adds just a touch of edge. 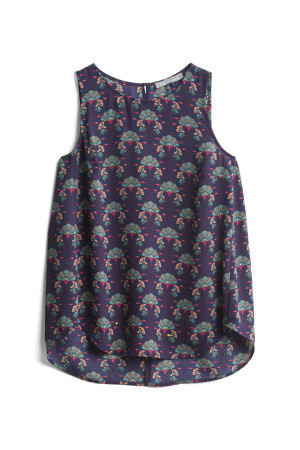 This top is a basic tank but the pattern and color palette make it special. As soon as I saw the print, I knew I had a lot of pieces already that I could pair with it. The style is also great now for layering but will be great in the summer when it’s hot too. My absolute favorite piece,this blouse is stunning. The colors are absolute perfection but the details of this blouse just add to the look. The little ruffle detail at the sleeves adds just a touch of “girly” without feeling too precious. The pintucking in the front adds a great detail that makes the blouse look more expensive than it actually is. For a girl that wears jeans or yoga pants pretty much every day, it’s hard to imagine loving dress pants again. My stylist Brittany has convinced me though with these lovely pants. 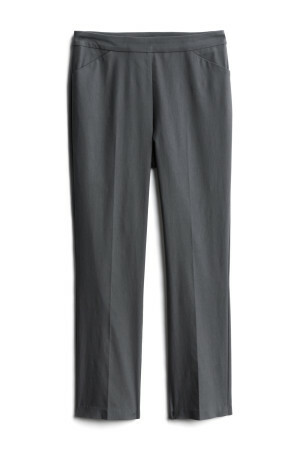 A nice deep gray and straighter cut is an updated shape compare to pants I currently own. The fabric has a stretch so they are comfortable too! This was by far my favorite fix for as long as I can remember. My stylist gave me dressier pieces without making me feel like I was wearing someone else’s clothes. 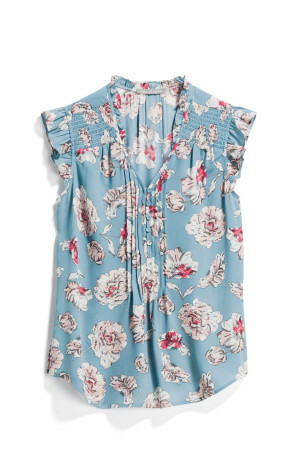 The Daniel Rainn blouse is a stand-out piece that I know I’ll be wearing A LOT! Want to try Stitch Fix for yourself? Check it out here and get $25 toward any purchase!